You can let everyone know you're going to be a singing star because you're going to Nashville! 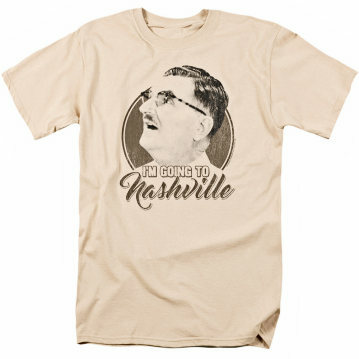 Or, you can be like Floyd and head to Nashville to hide from Miss Grayson, "I'm going to Nashville!" Just please don't start yelling at yourself in that looking glass. Floyd: Then I'm going to Nashville. Andy: You're not going anywhere. Quit flying all over the room and give me that haircut. Floyd: Hah! haircut! I can't give you a haircut. I just haven't got it this morning, that's all! Give me a haircut, he says! [Looks into mirror]: Floyd Lawson, you're a miserable, deceitful wretch!